The Apostolic Boys got started about 15 years ago as Joel II, Jared, Albert, and Troy began to sing southern gospel songs. Pastor Pace noticed that they needed some help, so he offered to sing with them. 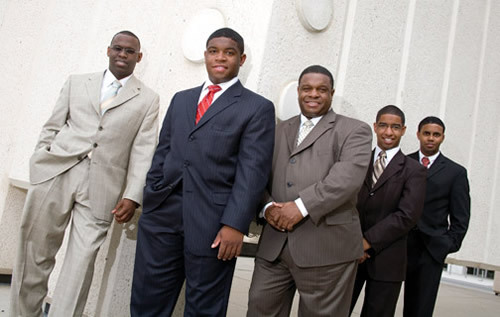 The quartet then consisted of Pastor Pace (Lead), Jared (Tenor), Joel II (Baritone) and Troy (Bass). Albert would fill in for a fifth part or be the lead on certain songs. The boys and Pastor Pace would sing at their church and other churches, and over time, the Lord began to anoint their singing! Songs such as I've Just Started Living, Master Builder, and Ride That Glory Train became songs that brought inspiration and blessed people that came to their concerts.. The quartet began to change as the Lord blessed and anointed Joel II (Joey) to play the piano and Albert to play the bass guitar. Albert has a very good voice and he became the baritone singer and Joey played the keyboard and sang sparingly. With this new formed quartet they began to sound better. Other churches began to request for The Apostolic Boys to sing at their church services, meetings and functions. Over the years, the group has traveled across the country, touring in Mississippi, Kentucky and Tennessee, as well as many other states. They have been featured on the main stage at National Quartet Convention (2009 & 2010) and with the Gaither Homecoming tour (2010). In 2005, they sang at the Southern Gospel News Fan Fest in Smyrna, Tennessee, and the first ever Southern Gospel Music Fan Fair in Chattanooga, Tennessee. They have appeared beside some of today's hottest gospel artists, including The Crabb Family, Gold City, The Booth Brothers and The Talley Trio. This talented group has recorded several CD's over the years with well-known producers and musicians such as Jeff Stice, pianist for the Triumphant Quartet, Otis Forest, Robb Tripp and many others. As the group says, "We thank the Lord most of all, that throughout the years of singing we have seen many people receive salvation, receiving the gift of the Holy Ghost, being born of water and Spirit, (John 3:5, Acts 2:38) and many back sliders have come back to the Lord at the many concerts, singings and church services. This is what it is all about and we give God all the glory." Pray for the Apostolic Boys that the Lord would continue to open doors for them to sing for the glory of the Lord to whom He would choose. They will be glad to come and sing for your church or activity, schedule permitting. If you want a quality concert with praise, worship and ministry, contact The Apostolic Boys today!